Thailand Cave Rescue - Operation Accomplished! All 12 boys and their football coach have been rescued from a Thai cave after an 18-day ordeal, the Thai Navy SEALs said in a Facebook post, adding they were "safe". 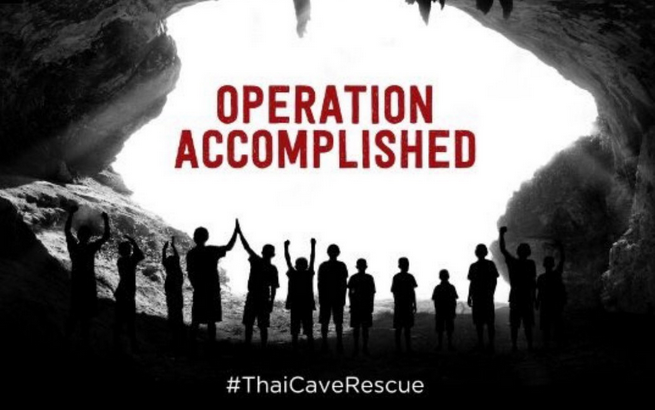 The Thailand cave rescue mission should go down in history as one of the most heroic rescue missions ever accomplished! On Tuesday morning, Permanent Secretary of the Public Health Ministry Jesada Chokedamrongsuk told reporters all eight boys are "in good health," with no fever and "in a good mental state." "They basically blindfolded them when they took them out of the cave to make sure that their eyes would slowly adjust to the light again after they have been in the dark for so long … the doctors have now said that their eyes are all fine," Vaessen said. "All five will be brought out at the same time today," Osottanakorn said. All 12 boys and their football coach have been rescued from a Thai cave after an 18-day ordeal, the Thai Navy SEALs said in a Facebook post, adding they were "safe." "All 12 'Wild Boars' and coach have been extracted from the cave," the post said, adding "all are safe" and signing off with a simple "Hooyah." World football association FIFA originally wanted to invite the boys and their coach to attend the World Cup final on Sunday, but that plan has been abandoned because the kids' doctors think they are not strong enough yet. Mission accomplished. God is awesome! Everyone who assisted is heroes. I am so grateful they were all rescued. RIP to the Brave Former Seal that died trying to save them. Lexy, your article is the most interesting and informative on the soccer team. This was excellent info. Thank you so much.